A FABULOUS photograph in all senses. Total misappropriation on my part. But who could possibly ignore this couple?! What could I extrapolate from a family (not mine) anecdote? I cannot make out the Cyrillic script at the bottom left but on the right it says Krasnoyarsk. Ancestry .. family history .. the ingredients that fall into place each time a child is conceived .. are not of interest to everyone. Which random segments of DNA contributed characteristics from a crowd of those who came before us ― inherited from which parent or which family line ― is of consuming interest to the self-actualized keepers of life's continuum. These days, certain aspects of social media are expanding such interest. My friend's mother Paule was born about 1913 in Siberia and raised there. 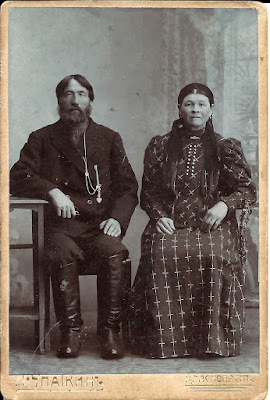 The family may have been of Lithuanian origin; the story is fuzzy on when-why-how they were in Siberia at the turn of the twentieth century (deportation by the czarist regime? Voluntary opportunity for land ownership or improved status?). But it seems her father married a native Siberian and had several children. The couple in the photo seem to be Paule's parents. We know Paule's father was some kind of provincial official in Krasnoyarsk. As part of his job he travelled regionally on a regular basis. The rather suspect aspect of the family story says Paule's mother would occasionally stray away to the steppes in her husband's absence and once had a fling with an enigmatic wandering Russian. Paule's son insisted his mother looked very different from her siblings. From that, beyond the lifetime of the original storyteller, some of us have extrapolated yurodivy ― the "holy fool" of Orthodoxy, a "crazy for God" ascetic. Less rigorously now, meaning someone outside of and rejecting conventional social norms. An eccentric who marches to an altogether different drum with often deliberately provocative behaviour. 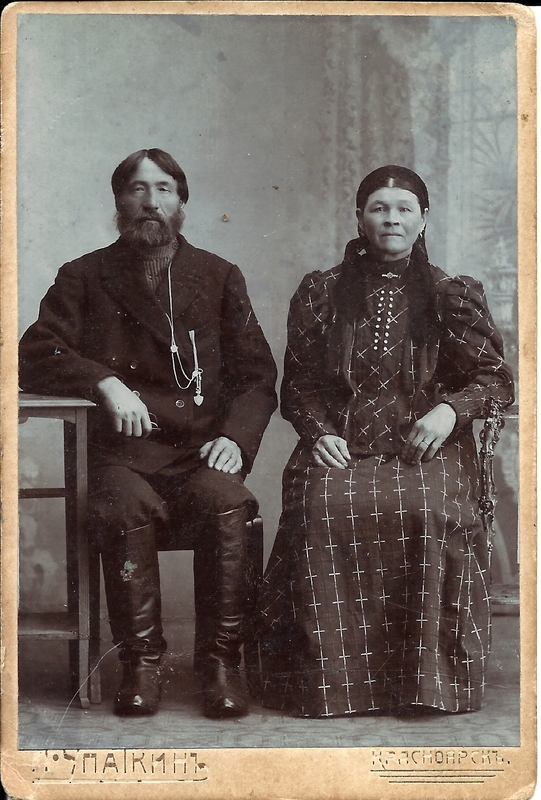 Paule's parents moved from Siberia to Lithuania, probably in the 1930s. She, Paule, became a teacher with several languages to her credit. Her story ended in Canada after tremendous trials during the Second World War. Some friends believe that Paule's only son inherited the yurodivy genes. Now deceased, his often erratic or bizarre behaviour was given the more convenient modern label of atypical bipolar disorder. 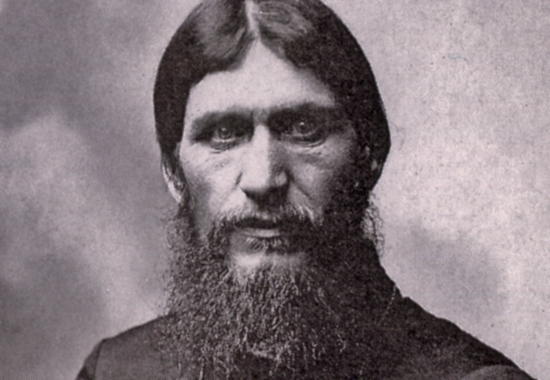 Despite the above gentleman bearing a superficial resemblance to Rasputin ― who by many accounts was a yurodivy ― he is clearly a married man of some comfortable significance. Without the photo, the anecdote is the stuff of exotic daydreaming. With it ... a bit of mysterious substance, if not genealogical evidence.